The number of dessert centric venues has risen in the past couple of years at a large and interesting rate; with each venue concentrating on one or several signature products. With the likes of Nola, The Batter Half & Co. and House of Cocoa leading the charge and becoming great successes, it was only a matter of time others would follow suit. Say Cheese is one such place making its mark in New Cairo. Specialising in cheesecakes, people from all the nearby areas flock to satisfy their sweet tooth needs with some cheesecake goodness. Say Cheese holds a third floor venue in a small mall on El Benouk Street, boasting a black and white themed decoration with only a couple of tables; while guests mostly take their cheese cake to go, it’s still nice to have the option. 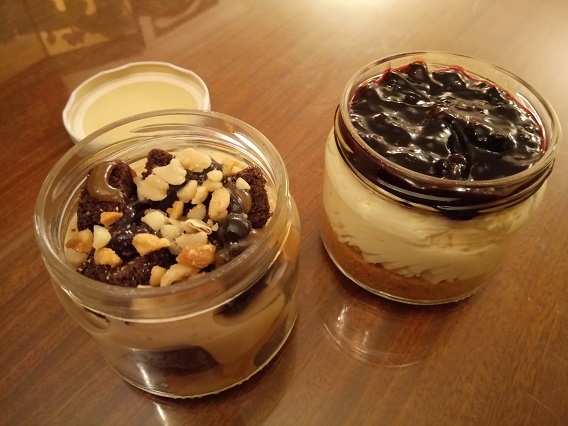 Offering their cheesecakes in glass jars – in both large (30LE) and small (25LE) sizes – we opted for the Raspberry Cheesecake, the Blueberry Cheesecake and the Peanut Butter & Brownies Cheesecake to get an all-round taste of what they had to offer. Both the raspberry and the blueberry cheesecakes had a bottom of biscuit crust topped with a hefty amount of cheesecake cream with each of their respectable flavour on top. As for the peanut butter and brownies, it had the peanut butter infused into cream with pieces of brownies mixed topped with some peanut pieces and some caramel. The blueberry had a slight acidic aftertaste that worked remarkably well with the smooth, rich, creamy, and sweet taste of the cream, while the raspberry offered more of the same but with a slightly sweeter aftertaste than acidic. Finally, the peanut butter and brownies had a creamy peanut-tasting cream that was almost savoury, but was perfectly balanced with the sweet chocolaty lushness of the brownies. Say Cheese has perfected the jar based cheesecake phenomenon and with high quality servings, we can’t wait to see what they will think up of next. Say Cheese offers a catering service - find out more on its official Facebook page. The light, creamy cheesecakes are jars sent from heaven. It's location isn't the best.